Telegram already boasts of a loyal 180 million user base, but the messaging giant is now looking to further its presence with the addition of new and handy features. 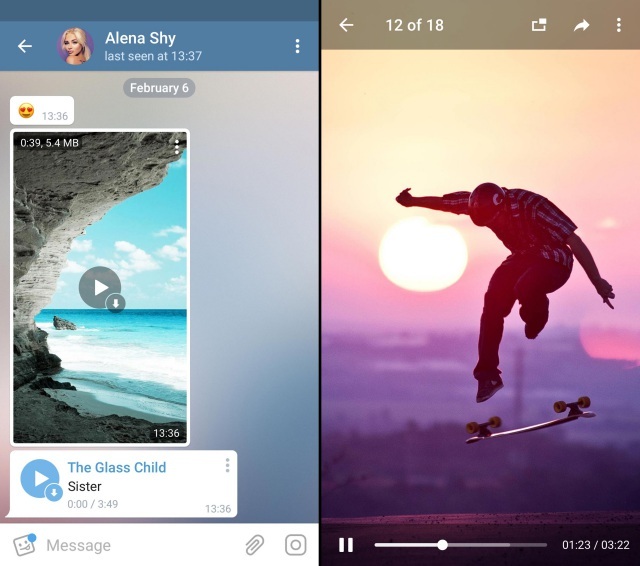 Just days after launching a second official app, Telegram X, the company has today added a handful of features to the original Android client. This update includes features such as automatic night mode activation, streaming of videos without downloading them beforehand, and the option to use Telegram to log into third-party apps and bot services. Alongside this update, Telegram has today introduced a new login widget for external or third-party platforms. It works in a manner quite similar to Google or Facebook login integrations. It allows you to input your phone number and authorize the browser to log in through the Telegram app on your mobile. Once you’ve completed the setup, the task of logging into websites with the login widget becomes only a two-click process. 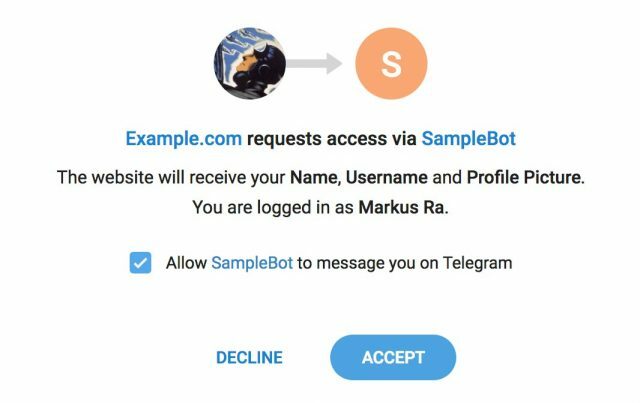 This will not only simplify sign up, but will also make it smoother for you to carry forward a conversation from the website to the app if the third-party is using a Telegram bot. As for the personal data that’ll be shared with these websites, Telegram says that only the name, username, and your profile picture will be sent over. Your phone number will remain hidden from them, and you can also keep a check on the list of websites you’ve logged into using your Telegram credentials from thePrivacy & Security settings. Telegram is taking a page from WhatsApp’s notebook for its next new feature. This feature may sound a bit alluring from the title but it means that you’ll be able to stream received videos from the get-go. You no longer have to wait for the app to fully download the video to start watching it. You can now simply hit the play button and the video will start playing, which adds to your convenience. It will also show you the caching progress as a light grey strip (as seen above on the right) so that you can know when a video is downloaded completely. This will only work with videos uploaded from official Telegram apps. We all love dark modes and want more companies to adopt it (looking at you, WhatsApp). 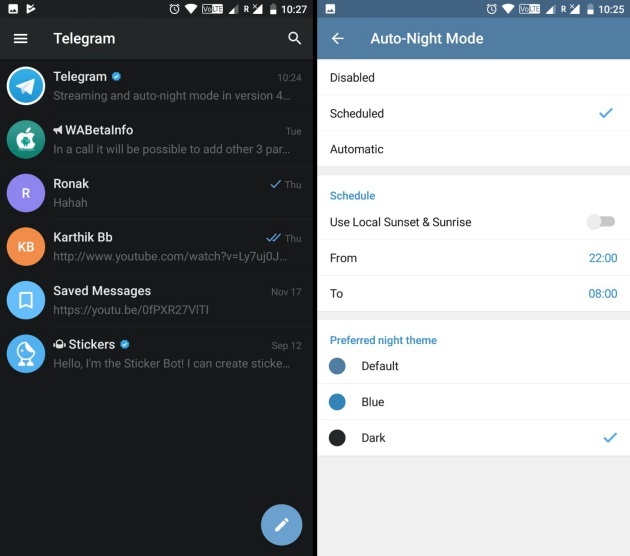 This ultra-secure messaging giant already has the option to choose a darker theme, but it is possible that you don’t want it to be applied during the day. And switching theme, again and again, can be a tiring process so Telegram has included the option to automate it. You can now open the hamburger menu by swiping to the right, navigate to Settings > Theme to find the newly added ‘Auto-Night Mode’ at the very top. Tap on the same to find three options, namely disabled, scheduled, and automatic. If you’re looking to try out these new features, you can head to the Play Store and install the latest version (#4.8) of the official Telegram client. This update has gone live only for Android users, while iOS users will have to wait a while to experience them.